I came across this beautiful car by SS Tuning and love the way the STI spoiler looks on the back. I've been looking for a spoiler to add to my 2013 S Focus (I know, the lowest of the low), and the finish on this car just looks perfect to me. I found it on Ebay and wanted to get some opinions from experienced and talented people on this site. The edge to edge measurement from the mounting base of this spoiler will be around 47-1/2 inches. We may only guarantee the fitment of this spoiler for a 15-17 Subaru WRX STI 4-Door Sedan. 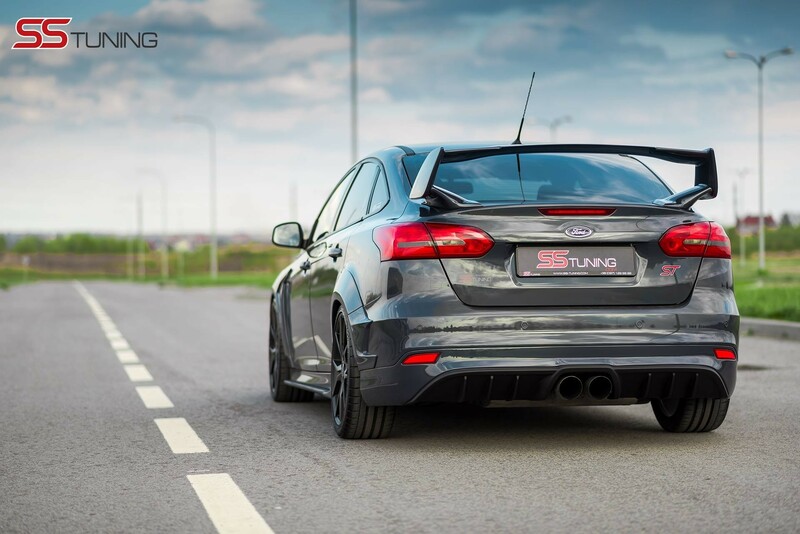 We are not sure if this spoiler may compatible for your Ford Focus Sedan. Please do note that even the overall length of the mounting from this spoiler may seem fit, but this spoiler is NOT mounting on the perfect flat surface. The 15-17 Subaru trunk curvature is most likely differ than your Ford Focus. Please do read and understand our return policy that if you purchased this spoiler to try it on your Ford Focus, but end up need to return due to not able to work out, there will be 20% restocking fees and you will also responsible for the return shipping to get a refund. Does anyone think I could find a bodyshop that would make this work? Is it a simple fix; grind and measure until the spoiler sits flush on the flat sedan trunk lid? Any thoughtful advice is much appreciated. Thanks for looking. From prev. threads when the SS Tuning car first showed up all we know for sure is that they use the WRX STI rear spoiler for their Sedan kit. Comparing measurements and looking at comparative curvatures of an actual Subaru sedan would be the best way to guess if any modifications were made to the spoiler base. Doubt any modifications were major (if any), the point was getting something in production to use that they liked instead of spending to build something similar. SS Tuning is a Ukranian company selling body kits/parts along with other performance items. The Focus sedan project lists a number of items from their catalog used, but the spoiler is not included in current catalog offerings. Can always ask about parts for the project as the catalog mentions, if they list the items they sell and tell you to source your own STI spoiler it's a partial answer. Disclaimer this post has no helpful information in it. That being said, I don't hate it but it's not my cup of tea. This is probably because I'm not into sedans tho lol. I wish you luck, and keep us posted. I'm curious. "We digitized it and made molds, changed the width of the spoiler and changed the "legs" on which it mounts. So it looks similar but its completely reworked... We will be making another updated version and it will be available for sale." Now this to me throws a wrench in my plans: Its completely custom work! This means that the body shop I've been in communications with is gonna have to do custom work to at least grind the legs and fill it with epoxy or something. That will probably be a couple hundred dollars over budget- likewise, ordering from the UK will probably be too much too. Definitely not liking this look as it's way too ricer for me. I am interested in the ST sedan though. Looks dope!